Emergency Room Physician. Student of science and student of scripture. Defending truth in a post-truth society. I believe that Truth exists, and I believe it is our duty and privilege to seek it out, amidst ignorance, frivolity, and misconceptions. Scientific textbooks show a diagram of the big bang and the subsequent expansion of the universe. So it must be true! Right? Someone took the time to draw a diagram, and lots of people copied and reproduced it, so it is a proven scientific fact, right? Well, lets look into that. “Looking up at a clear night sky, you see stars in every direction. It almost feels as if you’re at the center of the cosmos. But are you? And if not, where is the center of the universe? So apparently, since they could not find where the center was, they have decided there was no bang, or maybe the bang was everywhere at once. But first there was nothing, then EVERYTHING appeared ALL AT ONCE from nothing… EVERYWHERE. In fact “everything and everywhere just appeared all at once from nothing” is a quick summary of what science has to say about Origins. Did you catch that? Now of course the meaning of flatness in cosmology is entirely different than the meaning of the same word in geometry. Nevertheless, people used to think the earth was flat, and now cosmologists refer to the universe being “flat”. But note the phrase “cosmologists still aren’t sure“… but wait! I thought scientists knew exactly when the Big Bang occurred and how hot it was and that it came about due to the famous Heisenberg uncertainty principle! So let me get this straight. There was a Big Bang. 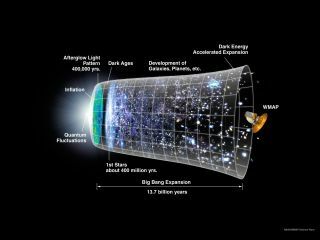 But since there is no sign of where the Big Bang occurred, we just assume it’s hidden, or maybe it is curved or flat or in a different dimension. But nevertheless, Woo and the scientists somehow know that we are certainly NOT at it’s center? To further explain this, let’s go to another well know internet site that explains the Big Bang, Cosmology and the “inflationary universe”. So you see, what we really have in the Big Bang is a “completely untenable” theory that must needs be rescued by any means necessary! But anyway, the ONE thing you can be sure of is that it is all under control due to the immensely strong effects of dark matter, right? That invisible , undetectable , theoretical stuff that holds everything together and keeps the universe “flat” (keeps it from exploding into nothingness). “If you were around in the 1500s, during the time of the Polish astronomer Nicolaus Copernicus, then the answer to this question would have been the Sun. Obviously, despite how we see the planets and stars moving across the night sky, our star is not at the centre of the Universe. So what is? If any of that makes sense to you, and explains where the universe originated… congratulations. Because scientists still don’t know. They really don’t have a CLUE! Posted on March 29, 2019 March 29, 2019 Leave a comment on The Center of the Universe? Respected authors from nearly all the world’s great religions and even many atheists have acknowledged that Jesus was a great man, a great teacher, a great intellect, or a great prophet. Billions of Christians believe, and Scripture teaches, that He was literally the Son of God and had access to the infinite knowledge of his Father in Heaven. Jesus spent his early life studying the Scripture (the Torah) and he was so intimately acquainted with it that he amazed the scholars of the day at the age of twelve years when he stayed behind in the temple after his family left Jerusalem. So first let it be established that Jesus had great knowledge of and respect for Scripture. In fact Jesus Jesus quotes directly from Genesis chapter one, treating it not as allegory or fiction, but as the real, historical Word of God, saying, “Have you not read that he who created them from the beginning made them male and female…” (Matthew 19:4) and also “But from the beginning of creation, ‘God made them male and female.’” (Mark 10:6 – parallel passage, but slightly different wording). 37 As it was in the days of Noah, so it will be at the coming of the Son of Man. 38 For in the days before the flood, people were eating and drinking, marrying and giving in marriage, up to the day Noah entered the ark; 39 and they knew nothing about what would happen until the flood came and took them all away. That is how it will be at the coming of the Son of Man. 40 Two men will be in the field; one will be taken and the other left. 41 Two women will be grinding with a hand mill; one will be taken and the other left. 42 “Therefore keep watch, because you do not know on what day your Lord will come. (Matthew 24:37-39). Genesis 1:26 God (with Jesus and the Holy Spirit) says let US make man. “I have made the earth, and created man on it. I—My hands—stretched out the heavens, and all their host I have commanded” (Isaiah 45:12). So, all things considered, it is evident that Jesus knew all the details of creation from an intimate, personal perspective, and he taught nothing about accidental cosmology, nothing about randomness in creation. Every aspect of creation was purposeful. Everything was for the glory of God. And finally, anyone who studies theology, knows that God created a perfect world, which is now under the curse of sin because of man’s actions. The theology of Christianity, sin, faith, and redemption is based on a perfect, created world, spoiled by the sin of humanity. It is based on a fallen world, and the entire fallen human race in desperate need of a Savior. “Therefore, just as sin came into the world through one man, and death through sin, and so death spread to all men because all sinned— for sin indeed was in the world before the law was given, but sin is not counted where there is no law. Yet death reigned from Adam to Moses, even over those whose sinning was not like the transgression of Adam, who was a type of the one who was to come.” (Romans 5:12-14) What happens to such a theology when death and evolution have supposedly been present for hundreds of millions of years before man ever appeared? It becomes worse than irrelevant. It becomes nonsense. If there was no Garden, no perfect creation, no Serpent, and no sin, then what would be the purpose of a Savior? Why, in Heaven’s name, would a Loving God allow his only Son to die a torturous death on the cross, unless it was exactly what the Bible says, the only path to redemption and salvation? For decades Christians have taken a back seat to secular scientists and atheists in speculation about the origins of the universe. But this no longer sufficient, no longer wise, no longer necessary. And scientists who are Christians are stepping forward by the tens of thousands to support the creation story.